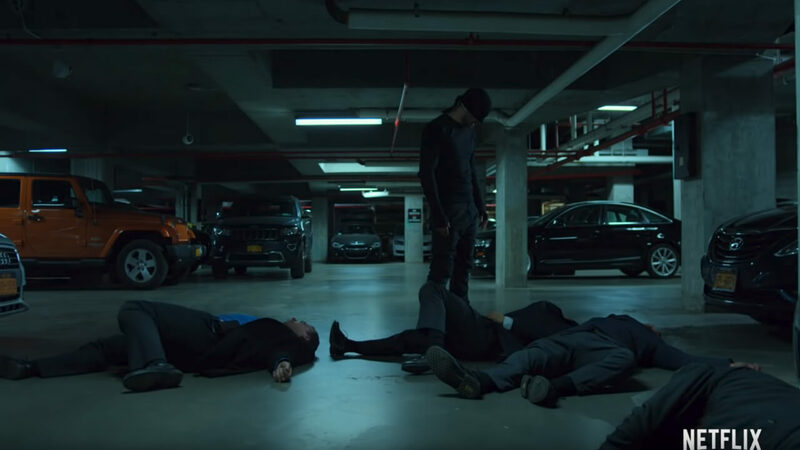 DAREDEVIL – The Final Review of NetFlix’s game changing 13 episode series! DAREDEVIL – Finally finishing this 13 part series, that everyone (quite rightly I think) is raving about, and it is a sea change of a series. Phenomenally good and had me captivated to the end, as those of you who have followed my previous posts can attest. It is and should be, justifiably lauded. That said, having finished the series, it is not perfect. I think sticking the landing is the hardest thing for any series to do, and after 12 fantastic episodes, I don’t think this series quite stuck the landing with the 13th episode. [Spoilers Follow]I think the series had such smart writing throughout but the ending felt a bit disappointing and by the numbers and a bit stereotypical. I found the character of Karen Page, while stunning, the weakest and most annoying and unlikeable character, part of this is in the writing, and part in the portrayal. And she gets progressively more annoying till the final episode. And the fact that great characters (both in terms of writing and acting) get killed (directly and indirectly) because of her, leaves an extremely bad taste. The loss of Vondie Curtis-Hall’s character of Ben Urich feels particularly egregious and formulaic and a bit stereotypical. “Oh a strong Black male character in a genre series, of course he needs to die in the noble savage role, sacrificing himself for the non-colored” 🙂. Like I said for a series that was so bold and smart throughout, it felt like dumbed down, lowest common denominator choices toward the end, which made the Karen Page character all the more unlikeable. The only person nearly as unlikeable as Karen’s character is the character of Matt Murdock. But that works because there are enough other facets to Charlie Cox’s great performance, and enough time spent away from him with more interesting characters, to assuage the more psychopathic parts to the character’s nature. But it does leave you with a final episode where it is not with Matt Murdock your sympathies lie, but with Vincent D’Onofrio’s brilliant Kingpin. It doesn’t help that the final Daredevil suit is pretty solidly a disappointment, and has one wishing for the return of the man in black. I’m still looking forward to more Daredevil, but I do think the lack of Vondie Curtis-Hall, the ludicrous costume, the too brutal Daredevil, and the grating, and annoying character of Karen Page has me less interested than I should be for a second season. Still and all kudos to fight coordinator Philip J Silvera, who makes this series one of the most adrenalin fueled of all time. All the more impressive since this appears to be his first long term Fight Coordinator gig. And of course kudos to Show Runners Drew Goddard and Steven S. Knight who spearheaded the birth of this first season. And of course to the writers and directors and actors. A second season has been green-lit but without Steven S. Knight of SPARTACUS fame, instead it will have show-runners Douglas Petrie (He wrote one of the best episodes of Season 1, STICK)and Marco Ramirez (who also wrote 2 solid episodes of season 1, RABBIT IN A SNOWSTORM and CONDEMNED)so they have the chops to make the 2nd season their own. Here’s hoping they do.